Pittsburgh, March 1, 2018 —Nearly 75 percent of college-age students say they support organ donation, yet more than two-thirds are not registered as an organ, tissue and cornea donor, according to national statistics. 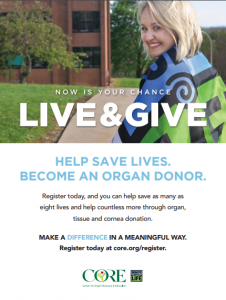 The Center for Organ Recovery & Education (CORE) is collaborating with student organizations from several western Pennsylvania colleges and universities to change that surprising disparity through the CORE College Challenge. 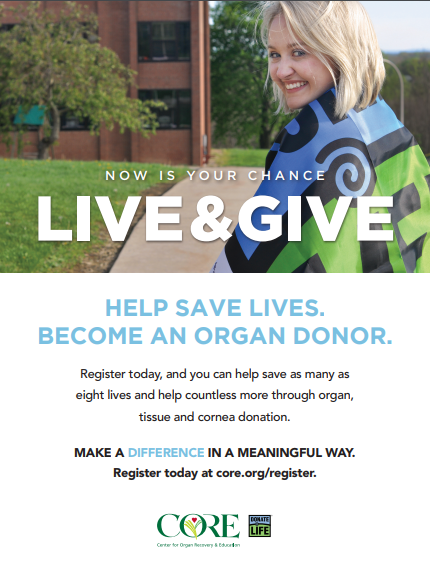 The friendly competition among campus groups encourages students to make a difference in a meaningful way by getting their fellow students to register as an organ, tissue and cornea donor. Participating schools include Duquesne University, Gannon University, Lake Erie College of Osteopathic Medicine, Slippery Rock University, St. Francis University, Penn State University Behrend and University of Pittsburgh. With 115,000 people on the national transplant waiting list, the need is great. Each organ, tissue and cornea donor can save up to eight lives and enhance as many as 75 lives. Through the CORE College Challenge, CORE provides educational and marketing materials to student groups so college teams participating in the challenge can orchestrate their own events on campus, talk about donation with their peers and encourage their classmates to register. The program runs through April, culminating in an event celebrating National Donate Life Month, which will recognize the winning student organizations. The Center for Organ Recovery & Education (CORE) is one of 58 federally designated not-for-profit organ procurement organizations (OPOs) in the United States. CORE works closely with donor families and designated healthcare professionals to coordinate the surgical recovery of organs, tissue and corneas for transplantation. CORE also facilitates the computerized matching of donated organs and placement of corneas. With headquarters in Pittsburgh and an office in Charleston, West Virginia, CORE oversees a region that encompasses 150 hospitals and almost six million people throughout western Pennsylvania, West Virginia and Chemung County, New York. For more information, visit www.core.org or call 1-800-DONORS-7.